Cydia Impactor is a tool to download third-parties apps and install it on a jailbroken iDevice using the process called sideloading on Windows, Mac, iOS, and Linus operating system. The Cydia Impactor can be used to root an Android device and jailbreak iOS. Other than that, you can also use the Cydia Impactor app or software to install Cydia and remove Cydia installer. Apple apps store is the official site to download apps for iDevice. The site comprises of both paid and free apps. Like Android, Google play store is the official source of apps. However, to download paid apps you need to pay a certain amount and this Cydia Impactor helps to remove so that when the tool is installed on either your iOS or Android device you will be able to download and install a third-party app, paid apps, games, and other utilities. The Cydia Impactor support iOS 11, 11.1, 11.2, 11.3, and support all Android version from CpuCake to Android Oreo. Therefore, if you are new to Cydia Impactor and how it works, here in this article, you will learn the rudiment of how Cydia Impactor works, link to download your OS copy, how to remove Cydia installer, and how to root Android using the Cydia tool. How to Install IPA Files on iOS using Cydia Impactor. First, grab a link to download your computer OS Cydia Impacto below. You can always get the latest update following the links provided. Also, follow the links below to download the IPA files for iOS 11 jailbreak. The links provide the latest updates with additional features and bugs fix. First and foremost, go back to the links provided above and install Cydia Impactor software for your OS. For Windows, click on Windows link, for Mac, click on the Mac link to download the latest version. Also, make sure that you have the latest iTunes version installed on your computer before you begin to install the IPA file compatible with your OS following the link provided above. Also, make sure that the IPA files you want to install on your iOS are also downloaded to the same PC with latest iTunes software. This process will install IPA files on your iOS 11 without errors. However, you were warned not to run the Impactor’s executable file as an administrator so that it’ll not disable drag and drop on your PC if you are running Windows 10. Apple iOS treats all apps that are not installed directly from Apple apps store as an untrusted device. However, within the settings, you can set any app you installed from other websites alternative to Apple store as a trusted app. However, here, is how to add the Impactor app as a trusted device. Once this is done you will be able to launch and use the app installed on your phone using a process called sideloading. There are some basic and popular errors you may encounter with the tool. These errors are probably normal because some of them are prone to a fix during the next update of the tool. Each of these errors means a different thing and it doesn’t occur on all devices. The process to fix these errors is different from one another. Hence, we take a look at how to fix the aforementioned errors. Following these procedures, you will be able to fix the above error in your Impactor tool after or before installing IPA files on your iDevice. There are two ways to fix this error message. Both methods work fine. The two methods are shared below. 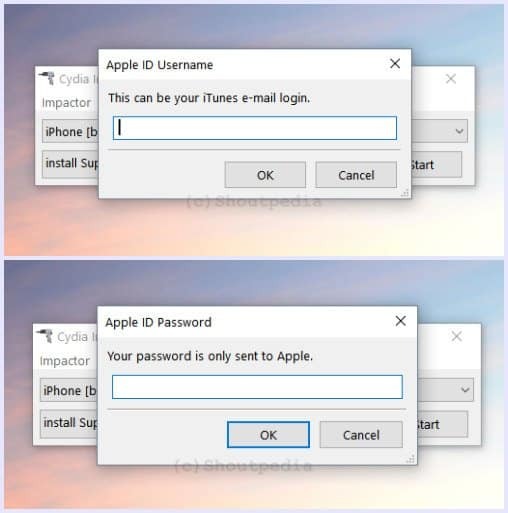 Turn off your Apple ID 2-factor authentication for the moment you want to use Cydia Impactor tool to drag and drop IP files on your phone and re-enable thereafter. This is the simplest. All you have to do to clear this error if you don’t want to disable two-factor authentication, use the app-specific password. This error message occurs most time with a poor network connection. To fix this error message, make sure you have a fast grooving internet connection. Remove the duplicate app you are trying to install using this tool. This error often occurs when there is an app is already installed on your iDevice and you are trying to install the same app using Cydia Impactor. Always check for the latest Cydia Impactor update following the link provided above. This error message occurs due to a corrupt IPA package or when you are trying to use old Cydia Impactor software. The best way to fix this is to check for Cydia Impactor’s update if you are sure that the IPA files are not bad or corrupt. To fix this error download and install the latest Cydia Impactor software for all your devices. Android users are not left out. With the Cydia Impactor tools for Android, you can root and unroot Android device. If you don’t want to use root apps like Supersu, Kingroot, RootApp, to mention a few, you can make use of the Cydia Impactor tool to grant your Android device a root access. To root Android device with Cydia Impactor follow these procedures. First and foremost, to be able to drag and drop the root app on your phone you must be in a developer mode to enable debugging mode on your device. Now that you have enabled developer mode, next is to enable debugging. Now that you have successfully enabled debugging mode, let proceed to how to root your Android device with the Cydia Impactor. Once the SuperSu is installed on your phone without error it means that you have successfully rooted your phone. To validate the root access of your phone download and install Root checker from play store. Run the app and it will tell you the status of your phone root access.